Rub Healthful™ Soothing Chest Cream into your chest to help minimize discomfort quickly. Herbal skin cream with fruit and root extracts helps thin chest mucus, reduces coughing and phlegm buildup. Lung relief cream contains 4 oz. Water, Propylene Glycol, Aloe Barbadensis Leaf Juice, Polyacrylamide, Methylparaben, C13-14 Isoparaffin, Propylparaben, Eugenia Caryophyllus (Clove) Oil, Laureth-7, Diazolidinyl Urea, Tocopheryl Acetate, Glycyrrhiza Glabra (Licorice) Root Extract, Scutellaria Baicalensis Root Extract, Citrus Tangerina (Tangerine) Extract, Salvia Officinalis (Sage) Leaf Extract, Retinyl Palmitate, Folic Acid, Magnesium Ascorbyl Phosphate, Schizandra Chinensis Fruit Extract. Apply generous amount to chest 3 to 4 times daily or as needed. *For external use only. Avoid contact with eyes. Consult your physician for uncommon, yet possible interactions with medications, or if you are pregnant or breastfeeding. I am asthmatic and have times when it is almost impossible to breathe. 15 minutes after applying this stuff, I can breathe easily and take a full breath. It's incredible. Works for colds, flu, pneumonia, etc., too. use it on chest for middle of the nite breathing problems and sleep soundly. only problem I can think of is I didn't buy it soon enough. I stock up so I will never be without it. RUB ON CHEST AFTER BATHING. HELPS YOU SLEEP WITH NO COUGHING. Will and have ordered more. Have used for years. Great when chest gets congested. With COPD, I need all the help I can get when it comes to breathing problems. I haven't used this yet but I have it just in case. I have COPD. I want to see if this will help my breathing. looked at review and thought I'd give it a try. will review later. This really works. I have COPD and it does calm the lungs, especially in the evening. No smell. Just comfort. Great product. I have COPD and it helps me to breathe easier. Wanted to see if it helped my breathing. I have developed a coughing in my throat & chest and can hear rattling in my chest & thought this may help ease the rattling & phlegm. Because it helps my husband sleep better at night. He has chest congestion. This product has been very helpful to my husband who has had lung problems since his youth. used it before...just forgot about it. My father has a lot of congestion in his chest. My husband has used this product and it helps him breathe better at night. He highly recommends this product. I had bronchitis and this helped me breathe. recommended by a relative - will see how well it works! I brought this item for my mom who has trouble breathing. She swears by it and so I'm ordering it again for her. It doesn't really have a smell. Does this lung cream contain camphor ? BEST ANSWER: Thank you for your question. The Healthful Lung Cream does not contain camphor in it. We hope this information will be of help to you. 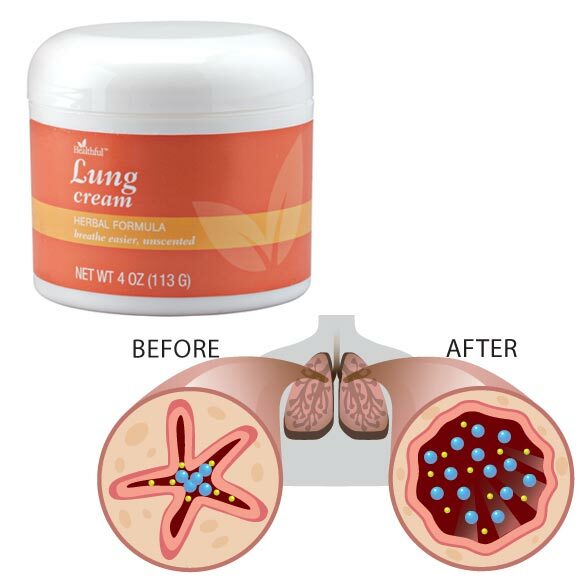 What are the ingredients in this lung cream? BEST ANSWER: Thank you for your question. We have listed below the ingredients for this item below. We hope this information will be of help to you.